The best steamers to give your clothes a new lease of life, pronto. Step backstage at a catwalk show and you’ll see more clothing steamers than hair straighteners. They’re invaluable for refreshing and de-creasing all manner of garments, quickly and easily. Don’t think of them as an iron replacement though. Keep your iron for crisp shirt collars, perfect creases in trousers and pressing hankies (if you still do hankies – we do!). Clothing steamers are better for taking creases out of more complex garments, including dresses. They’re also a good for refreshing clothes and giving once-worn garments another lease of life. They are good at sanitising (steam kills 99.9% of bacteria and lifts odours). Use them for steam cleaning curtains and upholstery. Whether you go for a small, portable steamer or a larger vertical model with built-in clothes hanger, the method is the same. Use one hand to hold the steamer and the other hand to hold the fabric taut as you go. We’ve tested a mix of clothes steamers to suit all budgets. Some are small and portable, others are larger because they include a garment hanger and have large water tanks so you can steam for longer. 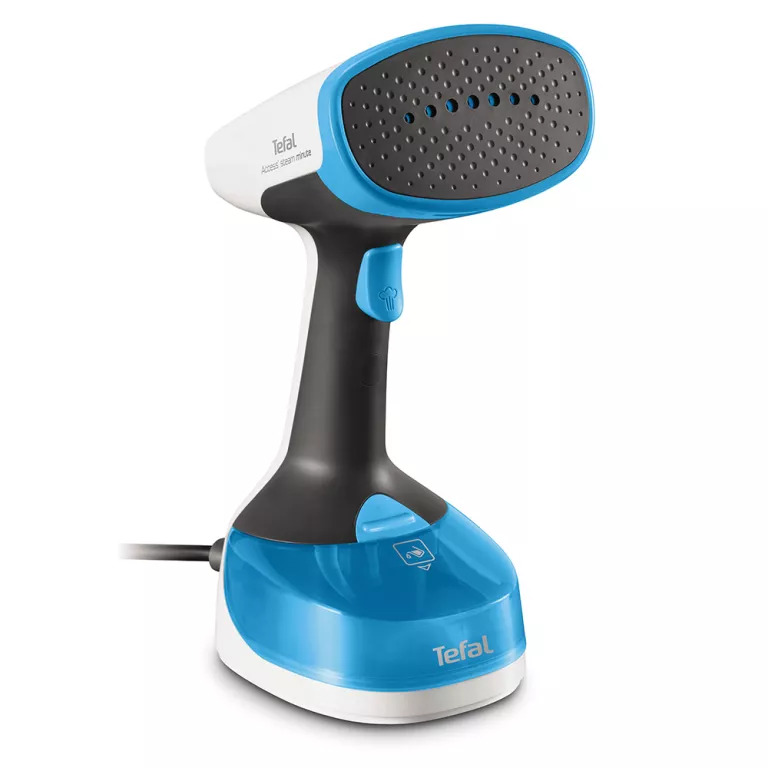 The Tefal is a vertical steamer with impressive build quality. Its triangular steam head is very effective. Its sturdy hanger has firm grips that won’t slide along the hanger unless you want them to. What’s more, you can turn the hanger around freely to get to all sides, but lock it in place when you want to. It’s pricey, but its powerful 30g/min steam and superior build make it a workhorse that can blitz the ironing pile (OK, steaming pile) fast. Unusually, there’s also a trigger button on the handle that lets you swap from diffuse steam to Precision mode, for a focused blast to kill creases. We also like the chunky power button, designed so you can turn it on and off with your foot. Assembly was straightforward and the telescopic pole means it doesn’t take up too much space for storage. It’s about the size of a cylinder vacuum cleaner. and there’s a nice space at the top to store the steam head. It comes with three attachments: upholstery brush, a very effective crease attachment and a steam cover for general use on delicate fabrics. You can’t remove the steam hose for storage, so just be careful when packing it away not to spill any water that’s left in there. If you’re on a budget then also consider the Rowenta, which performs just as well steam-wise for less. But you sacrifice some of the Tefal’s build quality and design touches. Cute and available in bright colours, this is the smallest vertical steamer on test. It takes up the space of a small cylinder vacuum cleaner, and looks like one too. It’s quick to assemble and the pole is telescopic, so it shrinks down small. The fold-up clothes hanger attaches to the front of the pole and a hook attaches to the back, to hold the steam head when not in use. The hanger folds up for storage, but this makes it a bit flimsy. It comes with an attachment for trouser creases, upholstery brush and a mat to put behind heavy materials to support them without scalding your hand. There are also clips for the hanger, to hold up items like skirts and trousers. The fold-up hanger is handy for getting polo shirts and T-shirts on and off, and turning garments around. But other vertical steamer designs are better because the garment sits over the pole, letting you access front and back without turning it around. The Fridja’s design is really annoying in this respect. Aside from that, the 30g/min steam performance is good, not great. You get your money’s worth and the 2.2 litre water tank lasts an hour, but it’s not as powerful as other vertical steamers. The crease attachment works well, the pad didn’t get used much because we were too busy using out other hand to hold garments taut for steaming. The large water tank and compact portability makes it a good buy if steaming curtains and upholstery is a priority. This elegant Philips clothing steamer has a slender design. It comes with an attractive, grey, heatproof storage bag that is also long and thin. It also comes with a silver heatproof mitt, plus a brush attachment. The water tank clips into the handle, so it’s slim and, at 70ml, too small. And its fill hole is small, so it’s tricky to fill it accurately under a tap. Its 24g/min steam function is pretty good. It feels like the vertical steam you might get from a steam iron. But unlike an iron, it’s very comfortable in the hand. There are lots of good, practical touches. The 2.5m power cord is longer than most and letting go of the steam trigger pauses it, so you can change garment or position safely or add the brush accessory without fear of scalding. We didn’t feel the need for the heatproof mitt, though. It was easier to do without and swap hands depending on which bit of the garment we were steaming. Results were good but we ran out of water far too quickly, after just two garments. The Philips is perfect for freshening up an outfit but it’s not designed to blitz the whole ironing pile. It’s not as cute as the Fridja, but the Rowenta offers better performance at a keen price. The machine is easy to assemble but a bit ugly. It takes up the space of a cylinder vacuum cleaner when not in use. It comes with crease attachment, upholstery brush and a lint brush. The hanger sits on top of the pole, so it’s easy to put garments over the top of it and you can steam all round, without the need to turn them. There’s space at the top to stow the steam head when not in use too, even with the crease attachment on. The 30g/min steam is powerful and does an impressive job, even on demanding items like shirts. Use one hand to hold the garment taut, steam it with the other, and you need only pass the steamer over it once. The 2.4 litre water tank is long-lasting too. The creasing attachment worked well too and was easy to get on and off without risk of a scalded hand. So trousers and shirts are both handled well, as are dresses and other garments. Our only niggle was that the two grips slide along the hanger too easily, so they don’t hold garments taut wide-ways. This is the cheapest handheld clothing steamer on test and the only one that doesn’t come with a fabric carry bag. Like similar models, it takes up no more space than a shoebox, including accessories. 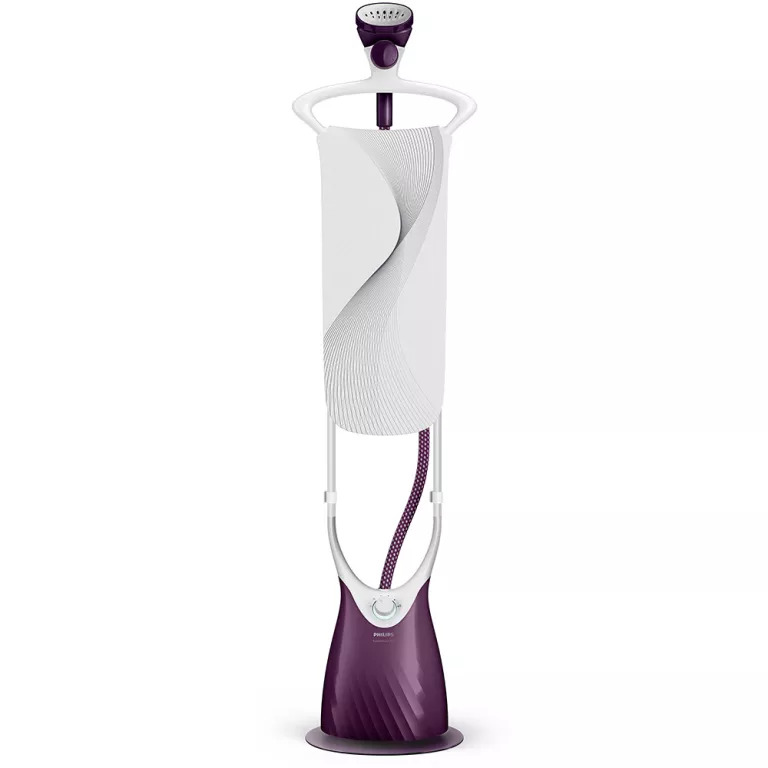 Comes with two attachments: a steam cover for delicate fabrics and a brush for heavier fabrics and upholstery. It also comes with a clever metal hook that loops over the top of a door, giving you somewhere to hang clothes for steaming. Its removable tank has a 150ml capacity and a tiny fill hole: it’s hit and miss under the tap, a bit like filling a water pistol. Then you turn it on and wait 45 seconds, until it stops flashing to indicate that it’s ready for use. You have to hold down the trigger button to get steam, which takes a few seconds to get started. And the power cable is a bit on the short side at 2m. We didn’t have high expectations but we were pleasantly surprised: the Tefal performed surprisingly well. The 17g/min steam isn’t powerful enough to give crisp results that rival an ironed shirt, but it’s good enough to make school polo shirts respectable, take creases out of garments of all shapes and sizes quickly, and freshen up clothes to boot. Great value and handy for a quick wardrobe refresh. This Fridja handheld comes with an oversized velvety bag that’s unisex but feels like it could happily belong in a boudoir. Accessories include a piece of plastic that promises sharper results on collars, a fold-up clothes hanger and a fabric guard to cover the steam head for delicates. There’s no brush. It also comes with a clever bottle adaptor, so you can travel lighter on holiday or to fashion shoots. Remove the Fridja’s fab 260ml water tank and use the adaptor to use it with most water bottles. The power cable is a bit on the short side at 2m but, that aside, it’s hard to fault. The design is clean and modern, with a big, bright power light. The 25g/min steam is powerful and the trigger features a sliding switch, so you can keep it on constantly if you want to. You can steam constantly for 8 minutes at a time. The collar accessory is good, not great. No steamer will really offer the same sharp results as an iron, but it does help a bit – you hold the plastic up behind the collar and it gives you something to push against. You only have to look at the Philips to see it’s a bit different. Other vertical steamers look like cylinder vacuum cleaners, with a telescopic pole on top and wheels on the bottom. This has no wheels and looks like it’s a clothes horse, designed to live in your bedroom or walk-in wardrobe. It does not belong in the cupboard under the stairs, not least because at its shortest it’s still 145cm tall. It’s expensive and the design seems over-elaborate, with two poles supporting the hanger and a springy steam head that bends back if you push it against a garment. It also boasts an anti-calc collector in the base and a space in the head for adding your own fragrances. A knob at the top lets you hang clothes on hangers and lock them in place. Unusually it also offers variable steam, with a dial on the base. There’s also a flat part that clips on vertically and looks like a mini ironing board – giving you something firm to push against when steaming. We were disappointed that it couldn’t pop out horizontally and double as a mini ironing board for those times (like creases in folded hankies) when vertical steam doesn’t cut it. And there are no grips for trousers! Instead, you’re supposed to drape them over the top of the board. Accessories-wise it comes with a brush for upholstery and thicker fabrics, and a silver heatproof mitt to protect your free hand. This proved useful because the variable steam is powerful at top whack (up to 40g/min). We loved the clever, unique design and found the board effective: it’s a bit like ironing vertically. But the price tag and the fact you can’t pack the Philips away well means it’s not right for many people. The elegant Philips lives in our fantasy walk-in wardrobe. We’d take out a dreamy outfit for the next day, steam it preparation and leave it there overnight ready for the office… or the ball. But we’d pick the Tefal if we had to steam a pile of clothes. 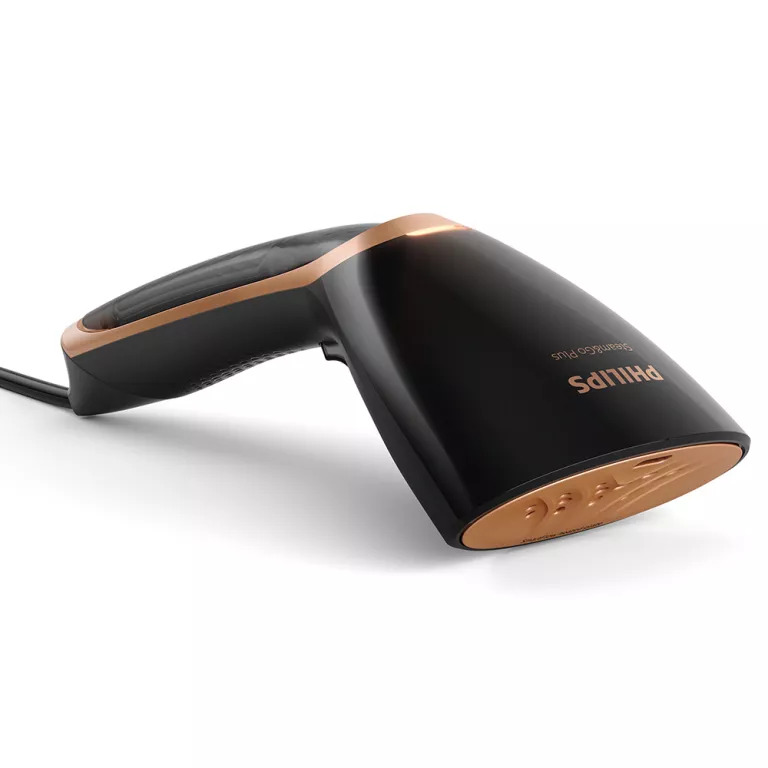 Handheld clothing steamer These pack away no bigger than a shoebox and are great for travel, taking to work or if you work in the fashion industry – stylists love them. But the price of portability is a small water tank that needs refilling if you want to blitz a whole pile of clothing. And you’ll need to hang your garments somewhere: a doorway is good. Vertical clothing steamer These clothes horse style clothing steamers include a clothes hanger on a telescopic pole. They typically pack down to the size of a small, cylinder vacuum cleaner. They’re much bulkier to store but steam is a bit more powerful and a large water tank means you can keep steaming for much longer. Bear in mind that many steam irons offer vertical steam too. So if it’s just for occasional use, you could use an iron that does both instead. If you want to steam lots though, clothing steamers feel much nicer than holding a heavy iron aloft. How much should I spend on a clothing steamer? Handheld steamers start at £50. They will do the job just fine. Budget at least £100 for a vertical steamer with clothes hanger and a much larger water tank. What else should I look for in a clothing steamer? Steam Measured in g/min, the larger the number, the more powerful the steam (removes creases quicker); a few steamers let you adjust the level for different fabric types. Water tank The bigger the tank, the longer you can steam for in one go. Accessories Handhelds come with few accessories, if any. Expect a soft cover for more delicate fabrics and a brush for tougher fabrics and upholstery. Vertical steamers often come with an attachment that helps you put creases in trousers, which work pretty well. Some steamers also come with a heatproof mitt to protect your free hand. The post Best clothing steamers – refresh clothes the easy way appeared first on Ideal Home.